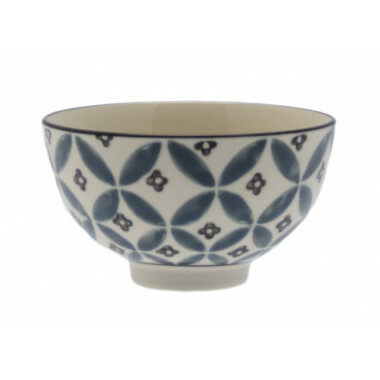 These Old Floor bowls are 11 cm wide and available in 2 different styles, blue and grey, on a beige background. These two small porcelain bowls are great to serve your sauces, jams, relishes or appetizers. These bowls are decorated with light colours and geometric patterns. Two designs available. Microwaveable and dishwasher safe. Sold individually. The Old Floor collection is the perfect tableware for your breakfast or teatime. Traditional tiled floors patterns are used as an inspiration for this china collection printed with modern, elegant geometric designs. These products are dishwasher safe and microwaveable.